A comprehensive introduction to the inner workings of rock music, The Foundations of Rock goes back to the heart of the music itself from the time of its birth through the end of classic rock. Walter Everett expertly takes readers through all aspects of the music and its lyrics, leading fans and listeners to new insights and new ways to develop their own interpretations of the aural landscapes of their lives. Written with style, Everett does not depend onmusical notation nor professional jargon, but rather combines text with nearly 300 newly written audio examples (performed on the companion website) and more than 100 expertly chosen photographs, to offer a rich text-and-web experience that brings new meanings to songs that have dominated music for ahalf-century. 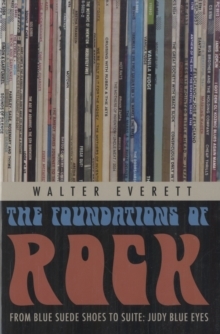 Through careful illustration, frequently citing the most familiar and pertinent examples from throughout the 1955-1970 period, The Foundations of Rock covers the nature and use of all musical instruments and vocal qualities; reveals the many different ways that phrases and sections of songs can be combined; discusses the materials and patterns in melodic, harmonic, and rhythmic invention; explains the many important ways that producers and engineers add to the artistry; and finallysuggests paths for combining an understanding of all of these elements with interpretations of a song's lyrics. This is all done in thorough detail, and always with an ear towards the possible meanings such techniques convey in a music that has had a profound impact upon our world. In doing so, Everett helpsreaders create new depths of understanding and appreciation. Hundreds of memorable hit songs are referred to in order to illustrate every individual point, while twenty-five diverse classics of the period have been chosen for very close hearing from multiple perspectives. The reader will come away with a much deeper appreciation of the music of the Beatles and the Stones, the Supremes and the Temptations, the Dead and Janis, Elvis and Buddy Holly, the Beach Boys and the Rascals.